Dr. Ibrahim Mohamed Kishk completed his MBBS from Al Azhar University in Cairo. He later obtained his Diploma in Orthopaedics from Tanta University, Egypt. Beside this Dr. Ibrahim also has a number of research and publications in his credit. He also keeps himself updated in his chosen field by attending conferences and workshops local and international. 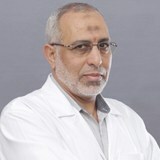 Dr. Ibrahim Mohamed Al Kishk has more than 29 years of experience in the field of Orthopeadics including working at Al Azhar University Hospital, Tanta University Hospital, Al Kubra General Hospital. He also worked in Al Nasar Sports Club before moving to the UAE and joining NMC Sharjah as a Specialist Orthopaedic Surgeon in 2008. Dr. Ibrahim Mohamed Al Kishk practices Orthopeadics and specializes in Trauma Management, Sports Medicine, and General Orthopaedics. His special area of Interest is in Trauma Management, Sports Medicine, and General Orthopaedics. Dr. Ibrahim is fluent in Arabic and English.